Endocarditis in the chronic form may be expected to lead to a certain alteration in the valves which guard the openings leading to and from the different cavities of the heart. The alterations of structure may consist of thickening of the valves, adhesion of one to the other at their edges in particular, and to the walls of the cavities. In some cases they develop large excrescences, or, as they are sometimes called, cauliflower growths, which occupy a considerable space in the cavities of the auricles or ventricles. (See Coloured Plate.) Among the domestic animals the pig appears to be most subject to these growths, which have been constantly found in the post-mortem examinations of animals which have died or been slaughtered in consequence of swine fever. A, A. Valves of the Heart much thickened as the result of Valvular Disease. 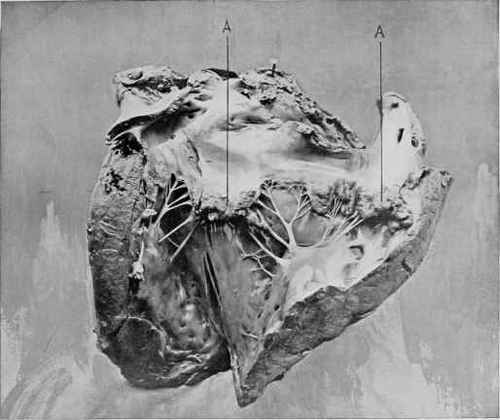 Calcareous degeneration of the mitral valve a, a. 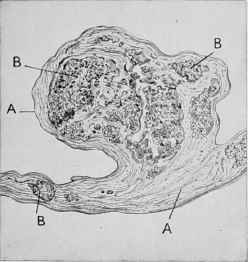 Fibrous tissue B, B, B. Calcareous degeneration. Fibrous vegetation of the mitral valve. PLATE XXXI. VALVULAR DISEASE OF THE HEART (Endocarditis). Many years ago Youatt referred to the common presence of these vegetations in the heart of the pig, and he noticed in particular that the animals in which the disease was detected in the slaughter-houses had given no evidence whatever of the existence of such tumours during life. Valvular disease in the heart of the horse is, according to Professor Nocard, more common than it is suspected to be. He has given a table of the relative frequency of the different valvular affections in that animal. Of forty-two subjects it was found that thirty-eight had disease of the valves of the aorta. In the other four, disease both of the aortic and mitral valves was detected. In some cases one of the normal sounds is obliterated, or may be reduplicated, or it appears every other or every second beat. The character of the morbid alteration varied considerably. 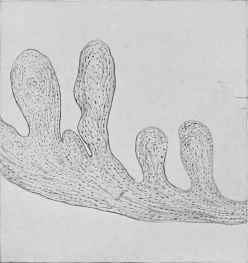 In some cases the valves were merely thickened and hardened, in others they were contracted, sometimes they were indented or perforated, and in others they were covered with fibrinous deposits. In the cases referred to, the diagnosis had been made during the life of the animal, and in almost all of them a blowing noise, which occurred during what would ordinarily be the interval between the normal sounds, was detected by auscultation. It is remarked by Dr. W. L. Zuill, in his translation of the work on pathology by Drs. Freiclberger and Frohner, that the first symptoms of this chronic inflammation of the lining membrane of the heart is the marked weakness of the animals while at work. They will stop, refusing to advance, and do not respond to the voice or to the whip. Treatment is not likely to be attended with any great advantage. The recommendation to avoid excitement and any active exertion is tantamount to proposing to keep the affected horse in the condition of useless idleness. For the purpose of temporary alleviation of the most marked symptoms, the use of iodide of potassium with digitalis is recommended, but, excepting where some special value is placed on the patient, economy, and humanity too, would be best considered by having him destroyed.